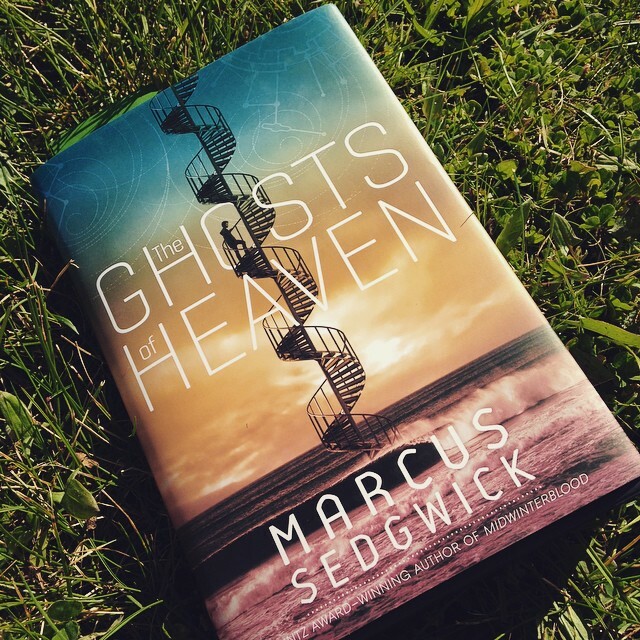 I’m a big fan of Marcus Sedgwick, who tends to write really dynamic, interesting stuff, and I was expecting more of the same from The Ghosts of Heaven. Perhaps I wasn’t in the right frame of mind when I read it, but it turned out to not be my favourite of his works. Which isn’t to say that it’s not a good book, just that I think other works were more gripping — but that may be because it feels like his books tend to fall into repetitive styles and themes. For all I know, a reader encountering Sedgwick for the first time might really enjoy The Ghosts of Heaven, as there’s a lot to enjoy, but find less to appeal in his earlier books. In this case, the book is divided into four parts, set in four very different time periods. The first features a girl living at the dawn of humanity who participates in the creation not just of art, but the rudiments of language and culture, turning art into readable symbols for her people. The second takes us to England in the time of witchcraft and a woman who runs afoul of the wealthy and powerful in her community. In the next, a doctor arrives at a mental health facility at the turn of the 20th century to bring new treatment techniques, only to find himself confronting the past he’s trying to run from. In the fourth, an astronaut floats alone in space, left with the responsibility of looking after a ship crowded with hundreds of people in suspended animation. Every section features different characters — though they nod to each other across space and time — but more critically, the common thread of spirals is everywhere. Sedgwick plays with spirals as a mathematical phenomenon and what we understand about them, but also with their aesthetics and the way we relate to them culturally. He’s clearly fascinated by the shape and delved deep into it during his research, and it fits smoothly and brilliantly into the narrative. The parts can be read in any order, with each part standing on its own much like a novella, and all four interlinking for those who want to read them that way. From a pure craft perspective, they’re well constructed and they work, which isn’t always the case with this approach. But this is a frequent trick of Sedgwick’s and it was one reason I found the book a bit stale — I’ve read this narrative style from this author before and while I like it, I’d like to see him push his limits and branch out into something else. I know he’s capable of taking on narratives from different angles and new perspectives. His very deftness with interwoven timelines illustrates that, so I want him to really demonstrate it. I have high standards for authors I really like because I know they have fantastic capabilities lurking below the surface, and I want to see creative growth. Selfishly, I also don’t want them to fall into formulaic writing because I want to keep reading new and interesting things from them, and I get bored with reading repeat iterations of the same book, which means I stop reading new releases from beloved authors. Depth and range are important. Sedgwick also relied on another trick he’s used in other texts: Very different voices for each section. Again, from a craft perspective, this is great. It takes absolute and undeniable skill and he definitely pulled it off. An entire section was written in verse, a conceit that normally doesn’t appeal to me, but he managed to make it bearable. Each book within the book is distinctive, with its own language, almost like a sampler of his writing talents. I appreciate that, just as I like the fact that all of the stories are completely different. Within the book, you can hardly complain about Sedgwick being formulaic. But he’s done this before too, with equal degrees of deftness and skill. We’ve seen him create overlapping and interweaving voices in text. As in The Ghosts of Heaven, they complement each other while remaining distinctive, but, again, I’d like to see him play with something else. There’s more than one way to tell a story and while I like that Sedgwick has pushed outside conventional narrative boundaries, he can’t stop there, frozen on the doorstep of innovation and refusing to progress a step further. I want more from Sedgwick — he’s like a talented actor who just plays himself over and over again, leading to wonder if perhaps he’s just a one trick pony. I want to believe that Sedgwick has a greater degree of depth and he can create totally different worlds, texts constructed in radically different ways, but I’m not really seeing that right now. I need him to convince me. I need his next book to punch out of the box and leap into my face, because I want to keep getting excited.